The Electronic Frontier Foundation thinks it's a bad idea for Google to combine my Web History (searches and sites visited) with information about my YouTube preferences. "…(S)earch data can reveal particularly sensitive information about you, including facts about your location, interests, age, sexual orientation, religion, health concerns, and more," the EFF notes ominously. How this is made worse by combining such facts with my YouTube activity is left to the imagination. You can read the EFF's analysis for yourself. Anyone who doesn't want Google to collect data about him or her has a simple remedy: don't sign in to your Google Account. 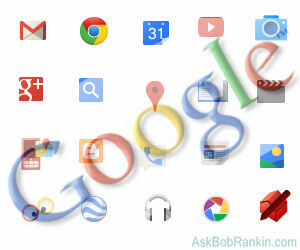 Google Search, YouTube, and some other Google services don't require you to have a Google Account. If you have to use Gmail, Google Calendar, Google Docs, or another Google service that requires a sign-in, you can always sign out when you're finished. But really, who wants to remember to do that all the time? Many sources are recommending that users disable and erase their Web History. But that really won't do much to protect your privacy. The Web History tool is simply your window into your own Web History. If you turn off that feature and delete your web history, you're only preventing yourself from seeing the data. Google will continue to log and have access to that data. Don't believe me? Here's a quote from Google's Privacy FAQ for Web History: "If you remove items, they will be removed from the service and will not be used to improve your search experience. As is common practice in the industry, Google also maintains a separate logs system for auditing purposes and to help us improve the quality of our services for users." The Bottom Line? It's the Bottom Line! I use Google's search engine, Gmail, Calendar, and Google Docs. I also use Youtube, Google Alerts, Google+, Picasa, Google Maps, Google Earth, Google Images, Google Wallet, Translate, the Chrome Browser, an Android phone, and various webmaster tools. I love them all, and would miss them if they disappeared. You might use Blogger, Google Groups, or Google Voice. Other popular services that Google provides for free include Google Books, Google News, Google Music, Panoramio, Latitude and SketchUp. And no, I don't think that's a naive position. You might think that Google would profit by selling such data, but they also have a lot to lose, if they were found to be doing such a thing. In an information economy and a world of fast-moving news, the loss of goodwill (and the inevitable flood of lawsuits) would do enormous damage to Google's business. So they actually have an incentive to abide by their "Don't Be Evil" mantra when it comes to your online privacy. I agree totally. I love my Gmail. I guess if someone is so paranoid about someone or something watching then, they should get rid of the computer. What are they doing that makes them afraid of others? Anyone who wants absolute anonymity on the web need only to download "Ultrasurf", and use it. Google Ultrasurf and go to their site and you'll find a bunch of "weird" stuff, but if you go to the bottom and click on the "About" link, you'll find their page about Ultrasurf. There isn't much information, but there is all you really need. It does make your surfing noticeably slower, as you are going through Ultrasurf's secure servers, where everything is encrypted. It's not the only way, but it is very simple, and works. But that's only if you care all that much about privacy. Recently I have noticed that everytime I go to Google to search, a window pops up asking me if I want only secure websites shown. Since I want them all, I answer no. This is an extra delay in my search which I do not appreciate. I am not technical, to be honest I doubt if I have ever read word for word any terms and conditions. I had been wondering about Google's new condensed rules but now that Bob is very relaxed about it I shall just go along with it. If it turns out a disaster I will blame myself and Google, NOT Bob. If it's good enough for Bob, it's good enough for me. The ones having trouble with this new policy are Googles competition they would love to stop Google from giving away all there services for free rather than have to compete head to head. Not withstanding the for-profit aspects this article has raised, with which I am in complete agreement, and at the risk of being flamed and having a tinfoil hat thrust upon my head, I would like to point out that Google and Microsoft have given personal data to the federal government under the Patriot Act and are in trouble in Europe at this moment over that action as it pertains to European citizens. The government doesn't need my personal data and I don't need to have the government determine my patriotism. If the soon to be amalgamated data about me were to be used solely by Google to further their profits, I wouldn't mind the new policy. But to have that data neatly collected for the use of the government to sift through (as they now "sift" through our clothing at airports with body scanners to view our naked bodies) I find abhorrent. I would like to thank Dadwhiskers for suggesting Ultrasurf. I'm going to give them a look-see. Thank you! Good to have your confirmation of what I've been thinking! Just had a little niggling thought that I was maybe missing something...now it's gone. What happens on my computer is my responsibility. You have saved me a lot of time and concern. I have not had time to read all that privacy stuff, but the fact that it was raised by Google made me feel nervous. Your opinion is always of great importance to me. Thanks for going into it in so much detail. Sorry, government authorities can't protect you from crossing the road either!!! I have long believed that one should be prepared for anything said on a phone, yes even a landline, a cell phone, put in an e-mail, added to comments on a web site and so on to become public. So if you don't want it to be public - don't say it or don't do it! Yes, I know there is a big rift between freedom of expression, freedom of information and privacy of information; but that's the result of instant communication over multiple channels. The head of Google is on record as being in favor of using the information gathered electronically through gmail, etc by our gov't agencies when they want to investigate. He spoke of being able to gather invaluable data on any individual without their knowledge or consent merely by tracking their habits on the internet or emails or those who email anyone with a gmail account. So while you may not have a problem with advertisers and google making money off of anylising your internet habits, the possibility of 'Big Brother' stepping in is entirely frightening, and not at all unrealistic. You could be denied insurance coverage because you 'Googled' several sites on Cancer. You could be looking at them because a friend is ill, but the perception is that you think you are ill. You could be turned down for a job because you visited the site of a rival political party. It truly is no one's business where you surf. Don't give up these rights so easily, as once they are gone, they are not won back easily. From what I was able to glean from a quick web search, UltraSurf overrides your firewall and all your policies. Personally, I don't trust anything that takes security out of my hands. I feel you can do just as well with good internet security practices, and not have an intruder. That said, if I was living in a repressive country, I would probably be happy to have a workaround to Big Brother's web controls. On privacy policies in general. A father of a teenage daughter complained to a department store that they were sending her brochures and advertisements for baby clothes and baby items, which he thought was inappropriate. Apparently, unknown to customers, the store was collecting data from purchases made with credit cards and associating it with names and addresses. "in order to provide better service"! On questioning his daughter, the father found out that she was in fact pregnant! He apologised to the store, but I don't think he should have. What right has a store to interfere in a sensitive family matter? What it the young girl had been raped and was too afraid to tell her father? So, yes, collecting information about users is quite conceivably inappropriate! As far as emptying my Web History, I have done that for years!!! It just something, that I have done and will continue to do. As for "ads", while I don't like them, I know that they do save most of us, money. NO ads, no service. As long as the ads, do NOT interfere with my viewing a page, I am okay with it. When, an ad 'pops up' and takes over my page, that is when I get mad. This is why, I use Ad-Blockers, to stop all of that. Off to the side, in view, but not in the way, is fine with me. As for the ads on my Smartphone, again, as long as they do NOT try to take over the whole viewing space, I am fine with it. I have gotten lots of good apps FREE, because of Google and ads come with the FREE. Oh, I forgot, I have an Android Phone. I still think, the most important service you can get for either your computer or smartphone ... is Anti-Virus Security protection.I have that, for both my computer and smartphone. Bob ... I must say, one of the most abusive users of privacy ... is the Phone Companies!!! They will sell anything, to make money!!! The Phone Companies sells email addresses, phone numbers, even ones that are un-listed, so on and so forth. So, if, anyone is really worried about Google getting 'private' information on them ... let them, first look at their own phone company!!! Everyone is affected by this, whether they have a land line or use just a cell phone. Just stop and think about ALL of the personal information, that Phone Companies have on each and everyone of us!!! They have it all ... our SS Numbers, our Financial information, the Address where we live, plus our most accurate, latest phone number and for many of us, the Work place. They want it all, JUST in case, you don't pay what you owe them, right? Right!!! So, let's get more upset with Google, than our own Phone Companies, which we think so little about. Bottom line, just who started all of this privacy invasion issue???!!! I say, it was the Bell System, years ago. I completely agree with you, Bob. Google knows it's profiting from your information, and so tells you. And that practice is for making money. What else did you expect? Google IS a company, and companies make money, except in North Korea. I'll tell you another case of personal information case that makes this controversy a picnic in the park. Some years ago, the government of a country, in the South Caribbean shore, grabbed personal information from citizens that initiated a recall process. Petition signs and registry forms were collected for this purpose. That information was used to deny those citizens government contracts, aid, jobs, access to public services and so on. Even consular services. This despicable action wasn't in the mood of making money. Not evil, then? As it was that government who collected and used that information against many of his nationals, every legal efort to complain or ban this has been sistematically shut down. You're free to believe this story is true or not. What is SO true, is that you can sue GOOGLE anytime you find it breaking the law or violating what they offered to you, and NO official agency or person will try to stop you. It's nice to be a citizen, and to be respected for by your government. Enjoy it. In case I have somehow mistaked in my last comment, that last paragraph was not directed to Bob, but to our fellow readers. Bob's got the right figure, if I am allowed to say. Sorry again for any possible misunderstanding. It's no different to Ebay I make a search for tents and I get ads for tents and camping gear. I'm not complaining I'm getting ads for what I'm looking for. Hi Bob, Of course my email will not be published by you! I know that, because you are Bob Rankin: it's simply not in your heart to ever betray us, your subscribers, ever, for a bit of filthy lucre. It's not money that's the root of all evil, but the LOVE of money. If Google suffered from that malady, would Google be so generous? I doubt it, and I stick with Google, use their Chrome, their g+, their You Tube, their Picasa - all for free. I don't use their GMail simply because I don't know how to. In return for what Google gives me, they can, with pleasure, have anything they might useful on my PC to keep themselves in their altruistic business. Your fine article on Microsoft vs Google, in that order, and the abominable Google- bashing by Microsoft, just confirms what I have personally experienced about Microsoft myself. I have never liked Microsoft and their dominating, self-centered ways.